In preparation for Christmas, I made some raspberry ice cream this week. I use the term 'ice cream' loosely, because I didn't really follow any recipe and probably added more raspberry puree than I should have done. My intention was to inject as much raspberry intensity as possible, but I misjudged the balance of cream to fruit. The result was as close to sorbet as ice cream................... not as creamy as ice cream, but equally not as 'icy' as sorbet. It was however, surprisingly delicious. Instantly refreshing with a slight icy crunch, closely followed by a creaminess which coats the tongue and holds the flavour of fruit for just that little bit longer. I did wonder whether I should call it a 'sherbet', although to be honest, I wasn't quite sure what the difference between a sherbet and a sorbet was. So I looked it up............... Apparently, sorbets do not contain any milk or cream, but sorbets often have milks (possibly buttermilk) added. So maybe this could be classed as a sherbet? But then again............. it contains cream! You know what? I'm really not great on 'definition-snobbery' and as I can't decide which 'box' to put it in, I've just called it 'ice cream-sorbet', because that seems to best describe the experience of eating it. The taste is unbelievable fruity............... It may be ambiguous in name, but in flavour, it sings 'raspberry' at you. As soon as the spoon approaches, the aroma fills the nose, urging you to taste. 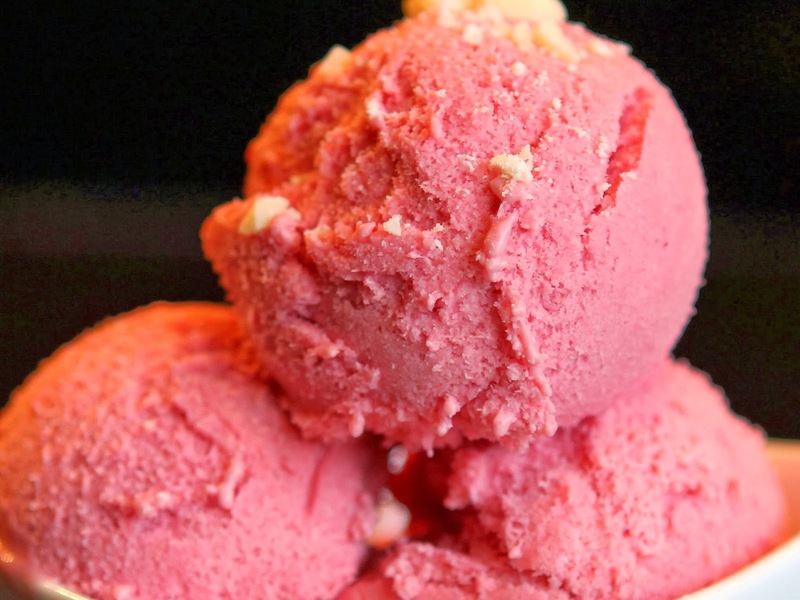 As it hits the tongue, the intensity of flavour wakes the taste-buds with a wonderful, cold sparkly raspberry zing............ As it melts, the cream holds and spreads the flavour so that it lingers after you swallow. Sweet and sharp at the same time, it is refreshing enough to quench a thirst and clear the palate, yet sprinkled with a handful of chocolate flakes and served with a crunchy biscuit, it makes an inviting dessert. Although the pomegranate doesn't identify itself freely, its addition does seem to add a very subtle 'otherness' to the mix, so that you know there is something else there, even if you can't quite put your finger on what it is. The raspberry remains the star of the show! So............ another mess up in the kitchen turns out to be a delicious discovery. Since I made it, I have had great difficulty resisting sneaky dips into the freezer............... Not sure it will last until Christmas! Puree the raspberries and pomegranate seeds with the lemon juice in a blender and then pass/push through a sieve to strain out the seeds. Set aside the puree. Pour the cream into a large bowl and set aside. Heat the milk, sugar and honey in a saucepan until steaming, but not quite boiling. Allow to cool slightly. Whisk the egg yolks in a medium-sized bowl until beginning to pale. Whilst continuously whisking, pour about half of the warm milk (a little at a time) onto the egg yolks until fully combined. Pour the egg-milk liquid back into the saucepan onto the remaining milk. Stirring constantly through the whole mix (to prevent any lumps forming), slowly bring this mixture to a simmer, and stir until the mixture thickens to a custard consistency and coats the back of the spoon. Using a sieve, strain the custard into the bowl with the double cream and stir thoroughly. Add the fruit puree and stir through. Cool and chill the mixture as quickly as possible. Once chilled, churn into ice cream-sorbet using an ice cream maker according to the manufacturer's instructions. Spoon into an air-tight container and place in the freezer to allow to complete the freezing process.